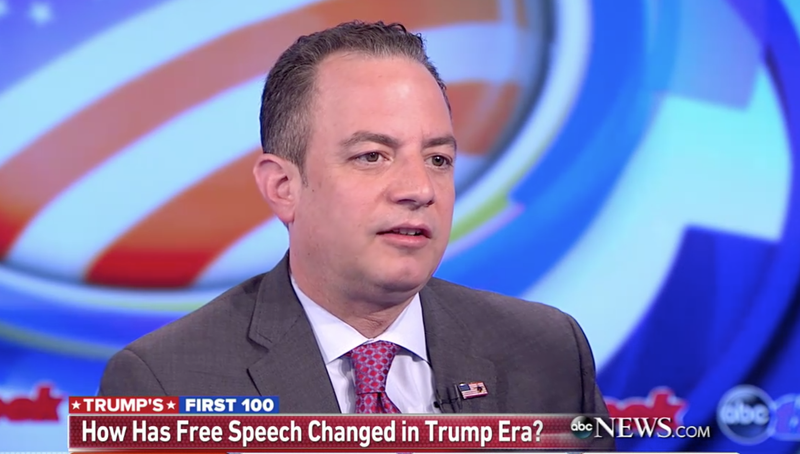 White House Chief of Staff Reince Priebus, appearing on ABC News this Sunday, was asked by network correspondent Jonathan Karl whether Donald Trump would ever do somethings as crazy as change national libel laws in order to curtail America’s free press. Karl’s question was prompted by a recent tweet from the president where he entertained the possibility of making a constitutional adjustment to libel laws. At a rally in Forth Worth, Texas in February, 2016, Trump told the crowd that if he were elected president he would “open up” libel laws so that he could sue outlets like the Washington Post and the New York Times when they write hit pieces about him. Karl followed up by asking Preibus, specifically, whether or not the president should have the right to sue media outlets that he personally finds to be unpleasant or in conflict with his insatiable ego. In the same interview, Priebus said the administration will also be looking into banning flag burning. None of this would be easy for the administration to pull off legally—for now these empty, antagonistic statements are all they have—but, for the record, for as long as it matters, Priebus and the administration he serves would like to limit freedom of expression as much as possible.